Takeaway #1: 41% of the world’s civilian-owned guns are in American hands. Takeaway #2: In the U.S., civilians possess 70 times more guns than cops + the military. 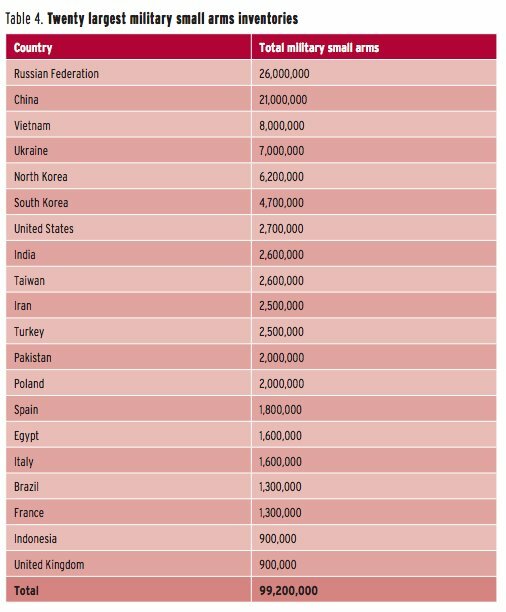 Takeaway #4: Americans own 70 million more guns than all of the world’s militaries — combined. Takeaway #5: American civilians own 11 times more guns than all the cops on earth. Takeaway #6: American law enforcement agencies are outgunned by civilians 235 to 1. [I think the number of guns in U.S. civilian hands is probably closer to 350 million 400 or 500 million (or perhaps even up to 660 million). If my experience at matches is any indication private citizens are far better shooters than nearly all police officers and military as well. At least it’s a start. Before he passed, Weapons Man did a blog post about how many Guns in American civilian hands, from my reading of it I came to the conclusion that the number is approaching half a billion, if not over it already. *grins at Weredragon* Ah, you saw that post too, eh? Weaponsman is SORELY missed. He was knowledgeable AND approachable — wonderful traits in today’s world. I know I miss him all the time and I never even had a chance to meet him. He thought the upper number was closer to 612+ million. I updated the post again. Thanks! She writes that as if it was a problem! She does work for an organization based in Geneva, home of various UN boondoggles. Though the “about us” page says it’s funded by the Swiss government, which one would think knows better than this. Agee. Let’s not stop till we are a true 3 gun nation. A rifle behind every blade of grass. I’d argue the 270 million and 350 million figures are low. Even my low side 2016 estimates put the numbers at excess of 400 million. I updated the post with a link to your thoughts. I’m quite comforted by these statistics. If US citizen firearms owners were a problem, there wouldn’t be anyone left who opposes us. They should thank God every day that they have not pissed us off enough. Yes, that’s a point worth making over and over. None of the bad things they say about us can possibly be true, because if they were, you’d see those bad things actually happen hundreds of times every day. Finally, for all those naysayers who say that with a government with F-16s, tanks, and nuclear weapons that we could never resist a tyranny I offer these facts and realities. Those law enforcement numbers make me think of Robert Peel and his Principles of policing: Peelian Principles. I’d like to start a fund to present a bronze plaque with these nine principles to every Law Enforcement agency in America. If arrests were all it took, the Soviet Union under Stalin would have been an idyllic place of harmony, peace and security, and no one would have anything to fear. And not the peace of the grave and the security of the slave, either. Anyone have any idea how much ammo we have to go with these numbers? I have seen some outrageous numbers tossed around on the internet but I don’t think there is any way someone could get an accurate figure. A best guess maybe. It has to be a few billion at least. That’s what should really be keeping these gun control jerk wads up at night. I would assume way more than “a few billion” — I know I’m way under-ammoed with maybe 200 rounds on hand. A friend of ours has a basement full, but then again he also has about a half dozen well filled gun safes. While I don’t know how much ammo is stockpiled, I have seen numbers in the past on importation or domestic manufacture of ammunition. A couple of years ago, I think it was 2013, civilian legal manufacture and importation was about 12 Billion rounds a year of ammunition. Combined military and law enforcement sales that year were less than 100 million rounds (maximum contracted – actual production was less). I have seen 10-12 billion reported before as well. It would be interesting to see numbers for 2015 and 2016. Someday I hope the rest of the world’s civilian population has a chance to catch up. years ago there used to be this saying circulated that went something like, “there exists one firearm for every twelve human beings alive on earth; the question is, how will we arm the other eleven?”. it seems this now may need updating — perhaps we only need to arm the other five or six?